While the main purpose of bake sales and other food sales is to raise money for the sponsoring organization, the safety of the food sold, and the safety and health of the customer buying and consuming it cannot be compromised. In order to ensure the safety of all public consumers, the State of Illinois and local governments have developed a set of laws, rules, and regulations governing the sale of foods within the state. Two of the Illinois Department of Public Health regulations that pertain to the local sale of food products are quoted below. As long as the bake sales or other such events are not an established, regularly occurring function, the Mason County Health Department is not likely to inspect them on a regular basis. Our department will randomly inspect these occurrences to ensure that public health is not compromised. Our department welcomes any opportunity to discuss the proper methods needed to ensure that public health is maintained. Furthermore, there will not be permits issued for this occasional event. However, if a complaint is made about the food, sanitation, premises, food servers, or any other facet of the operation, or if any illness occurs that is traced to food from such an event, the Mason County Health Department will become involved. Liability is automatically assumed by the organization conducting the bake sale if they do not follow the established laws, which regulate the preparation and sale of food to the public. The organization is responsible for providing wholesome food to the public and handling the food products appropriately before and during the sale. However, the consumer must also take responsibility for proper handling of the product after purchase. Please contact the Mason County Health Department when planning a bake sale or other event where food products will be served to become familiar with the regulations involved and to set up a time to discuss the event with a sanitarian. All items at a bake sale should have a label that identifies the product, and furthermore, identifies the name and address of the individual that prepared the food items. This is extremely important because it will allow the Mason County Health Department to more readily identify the food source of a food borne illness, and to quickly prevent any further spreading of a food borne illness if such an event was to occur. It is important to know that putting your name on a product does not increase your liability, because even without your name on the food product, you are still responsible for preparing and handling the product properly to ensure that public health is maintained. Therefore, one way to avoid creating legal problems for your organization is to be extremely scrupulous about safety, sanitation, and consumer concerns about all food products offered at a bake sale or other event offering food products for distribution. The safest foods to sell are baked goods such as cookies, breads, cakes, and candies, and unsliced fresh fruits and vegetables. Baked goods that contain cream or custard fillings or frostings are not permitted. These items contain moisture, which can support the rapid development of unwanted food poisoning organisms. Some foods are not permitted to be offered for distribution at these occasional events due to the hazards involved if they are mishandled. The items that are prohibited to be distributed at these events are food items that contain custards (pumpkin pie, coconut pie, banana pie, chocolate cream pies, etc.) any cream-filled baked goods (cream puffs, éclairs, etc. ), soft cheeses, raw fish and shellfish, products containing raw milk, and nay meat or poultry products including homemade sausage. The distribution or sale of raw milk or home butchered meats either directly or in cooked dishes, baked goods, candies or in any other form is prohibited. Only jams, and jellies may be distributed or sold at these occasional events. These products must have been processed in a boiling water bathe with two-piece canning lids. The sale or distribution of jams or jellies sealed with paraffin is prohibited. The sale of home-canned vegetables, meats, or meat-containing foods such as mincemeat, poultry, or fish products or prepared dishes containing these products is prohibited. Homemade ice cream using raw eggs that are not pasteurized or from an uncooked custard base is prohibited. 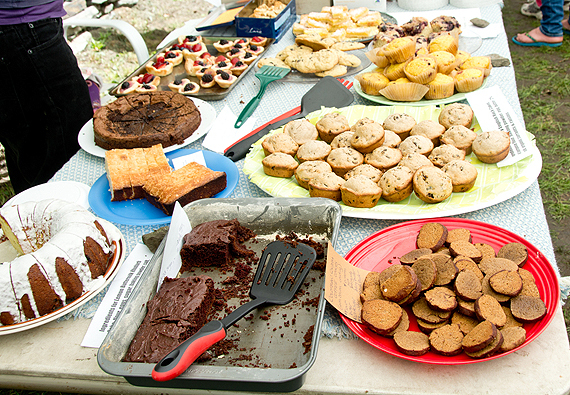 All food items distributed or sold at a bake sale must have a label identifying the product, and the name and address of the person who prepared it. All food products must be adequately covered or protected from dust, contamination, and direct contact with hands or fingers. Pre-wrapping all products is recommended to eliminate this possible source of contamination. No cutting or preparation of products is permitted if the facility does not meet temporary food stand constructional requirements. These requirements include a floor that is non-absorbent and easily cleanable, a completely screened in or enclosed facility to prevent the entrance of insects and rodents, a hand washing basin, and proper sanitizer for utensils and cleaning of surfaces. No person who has a cold, is ill, or has a sore or infected cut on the hands, face, or arms is permitted to serve food products to the public. These people may perform other duties such as clean-up, handling of money, or any other non-food contact responsibility. It is important to preplan your event to know who will be responsible for different aspects of the sale in order to avoid confusion. If a product is a special food item for people watching their diets for allergy, weight control, or other health reasons, it is recommended that a special table be set up for these items. This may attract extra customers who are not used to finding their special foods at bake sales. Check with the Mason County Health Department to receive any further information and to set up a time to discuss your bake sale in order to ensure that public health is maintained.